For Construction billing of buildingsMany ERP Solutions Require.1.Tower wise data (Required). 2.Unit wise data (Required but may be relaxed ) Additionally the best billing practices (Procedure) require the process to be:1.Simple & easy to work with and understand. 2.Transparent and Electronically Audit-able. 3.The important data such as BOQ item rates and material coefficients etc. should be tamper-proof. HOW EXCEL CAN HELP? A few of Excel tricks can make you achieve all the above and more. This tutorial shall help you to achieve the best construction billing practices which are essential for effective SAP implementation and utilization of the data for project related time and cost analysis for Project Monitoring & Control. The good news is that you need not change your computer hardware or billing engineer though faster computer would help. 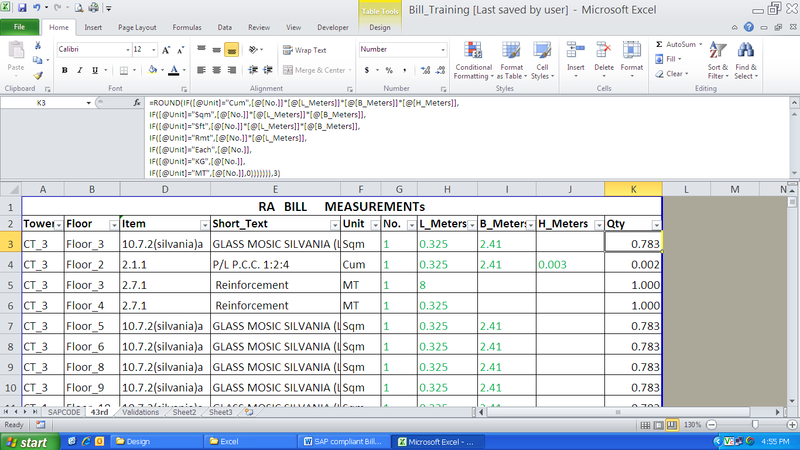 It is assumed here that your billing engineer is already preparing the bills using Excel 2007 or 2010.